How can I crop raster objects to vector objects, and extract the summary of raster pixels? Crop a raster to the extent of a vector layer. Extract values from a raster that correspond to a vector file overlay. This episode explains how to crop a raster using the extent of a vector shapefile. We will also cover how to extract values from a raster that occur within a set of polygons, or in a buffer (surrounding) region around a set of points. We often work with spatial layers that have different spatial extents. The spatial extent of a shapefile or R spatial object represents the geographic “edge” or location that is the furthest north, south east and west. Thus is represents the overall geographic coverage of the spatial object. Frequent use cases of cropping a raster file include reducing file size and creating maps. Sometimes we have a raster file that is much larger than our study area or area of interest. It is often more efficient to crop the raster to the extent of our study area to reduce file sizes as we process our data. Cropping a raster can also be useful when creating pretty maps so that the raster layer matches the extent of the desired vector layers. 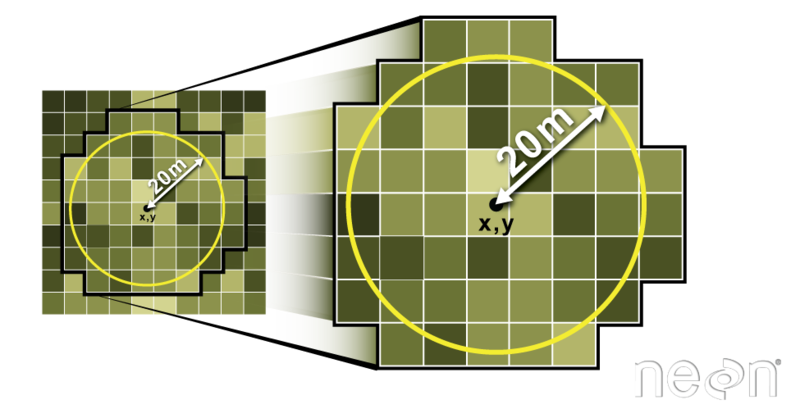 We can use the crop() function to crop a raster to the extent of another spatial object. To do this, we need to specify the raster to be cropped and the spatial object that will be used to crop the raster. R will use the extent of the spatial object as the cropping boundary. To illustrate this, we will crop the Canopy Height Model (CHM) to only include the area of interest (AOI). 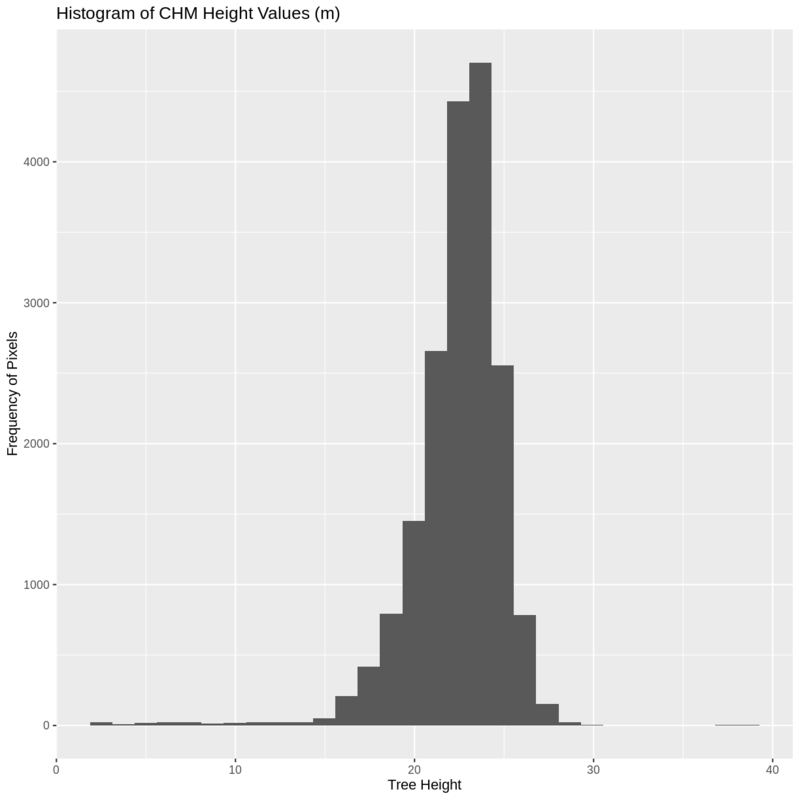 Let’s start by plotting the full extent of the CHM data and overlay where the AOI falls within it. The boundaries of the AOI will be colored blue, and we use fill = NA to make the area transparent. Now that we have visualized the area of the CHM we want to subset, we can perform the cropping operation. We are going to create a new object with only the portion of the CHM data that falls within the boundaries of the AOI. The function crop() is from the raster package and doesn’t know how to deal with sf objects. Therefore, we first need to convert aoi_boundary_HARV from a sf object to “Spatial” object. 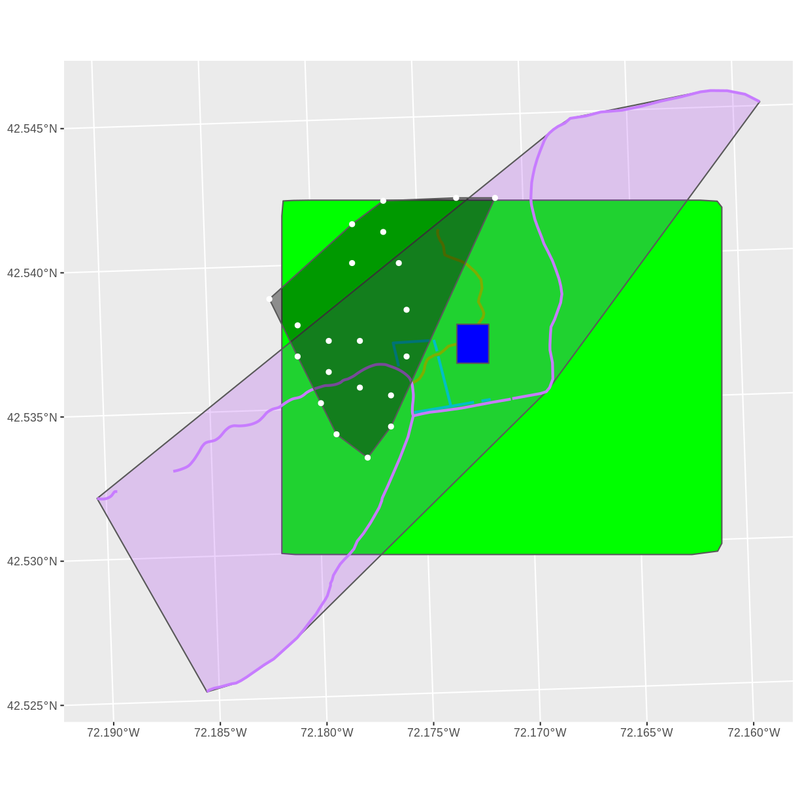 The plot above shows that the full CHM extent (plotted in green) is much larger than the resulting cropped raster. Our new cropped CHM now has the same extent as the aoi_boundary_HARV object that was used as a crop extent (blue border below). We can look at the extent of all of our other objects for this field site. Our plot location extent is not the largest but is larger than the AOI Boundary. It would be nice to see our vegetation plot locations plotted on top of the Canopy Height Model information. 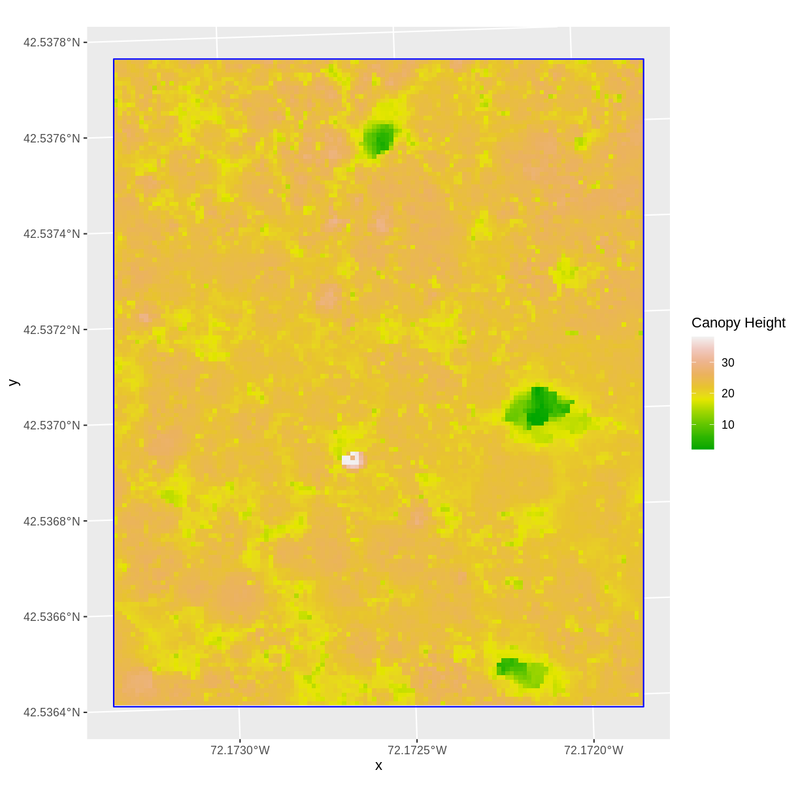 Crop the Canopy Height Model to the extent of the study plot locations. 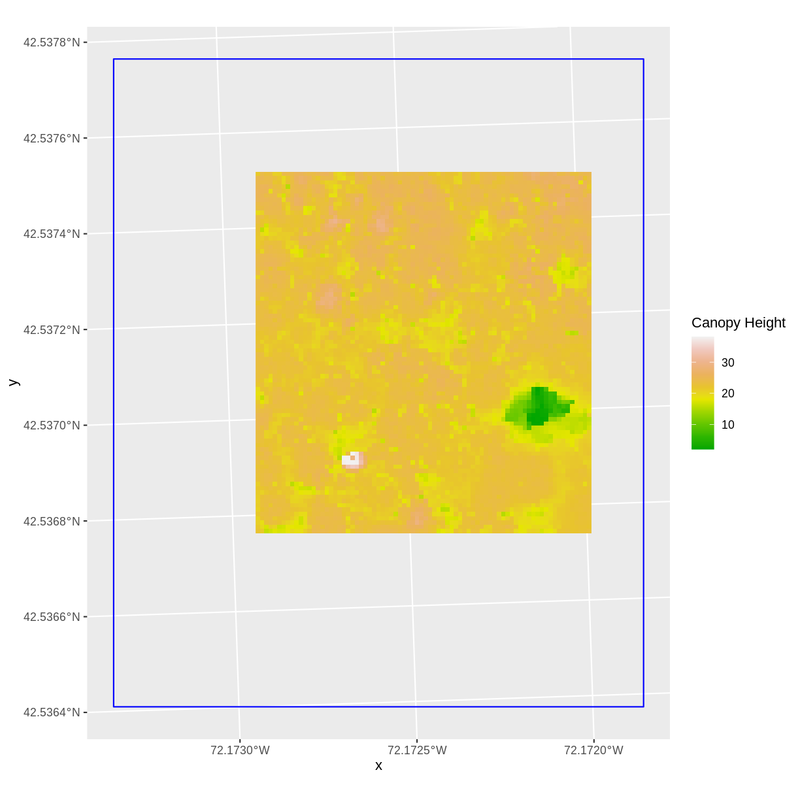 Plot the vegetation plot location points on top of the Canopy Height Model. 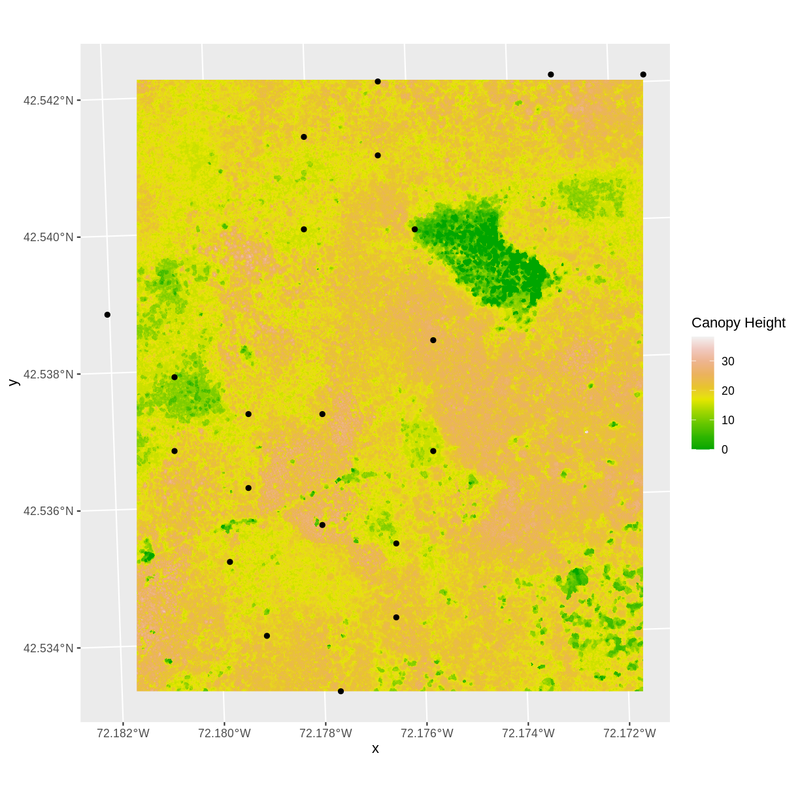 In the plot above, created in the challenge, all the vegetation plot locations (black dots) appear on the Canopy Height Model raster layer except for one. One is situated on the blank space to the left of the map. Why? A modification of the first figure in this episode is below, showing the relative extents of all the spatial objects. Notice that the extent for our vegetation plot layer (black) extends further west than the extent of our CHM raster (bright green). The crop() function will make a raster extent smaller, it will not expand the extent in areas where there are no data. Thus, the extent of our vegetation plot layer will still extend further west than the extent of our (cropped) raster data (dark green). So far, we have used a shapefile to crop the extent of a raster dataset. Alternatively, we can also the extent() function to define an extent to be used as a cropping boundary. This creates a new object of class extent. Here we will provide the extent() function our xmin, xmax, ymin, and ymax (in that order). The extent can be created from a numeric vector (as shown above), a matrix, or a list. For more details see the extent() function help file (?raster::extent). Once we have defined our new extent, we can use the crop() function to crop our raster to this extent object. To plot this data using ggplot() we need to convert it to a dataframe. Now we can plot this cropped data. We will show the AOI boundary on the same plot for scale. 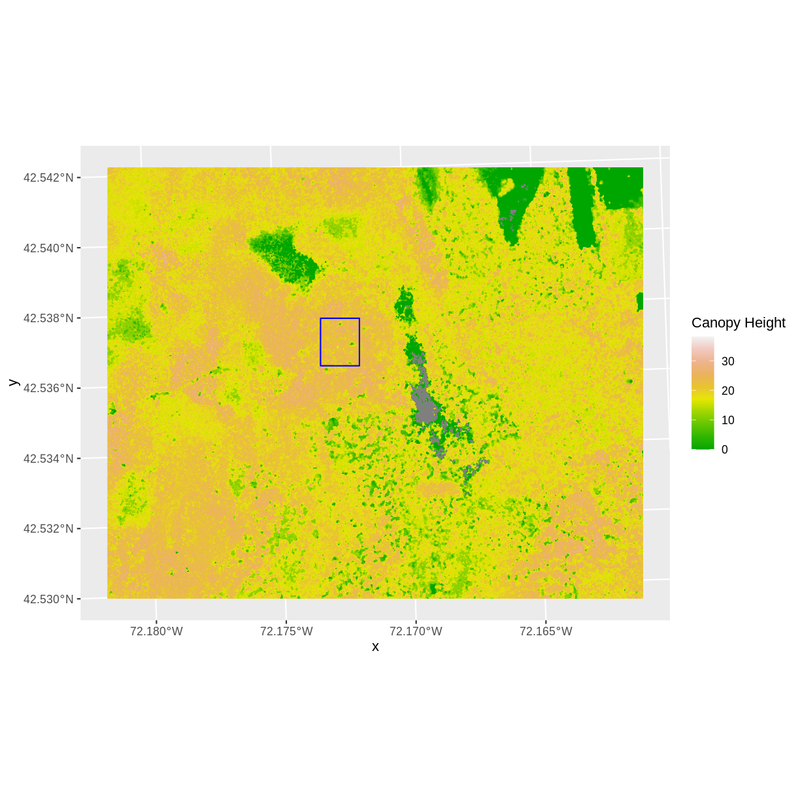 Often we want to extract values from a raster layer for particular locations - for example, plot locations that we are sampling on the ground. 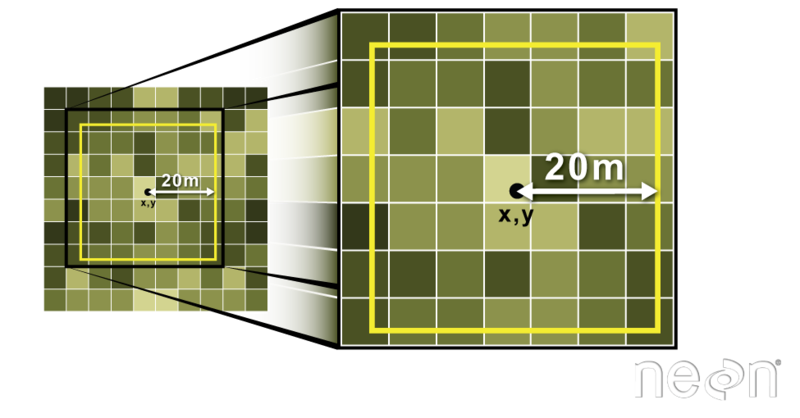 We can extract all pixel values within 20m of our x,y point of interest. These can then be summarized into some value of interest (e.g. mean, maximum, total). we can tell it to store the output values in a data frame using df = TRUE. (This is optional, the default is to return a list, NOT a data frame.) . We will begin by extracting all canopy height pixel values located within our aoi_boundary_HARV polygon which surrounds the tower located at the NEON Harvard Forest field site. When we use the extract() function, R extracts the value for each pixel located within the boundary of the polygon being used to perform the extraction - in this case the aoi_boundary_HARV object (a single polygon). Here, the function extracted values from 18,450 pixels. We can create a histogram of tree height values within the boundary to better understand the structure or height distribution of trees at our site. We will use the column layer from our data frame as our x values, as this column represents the tree heights for each pixel. We can also use the summary() function to view descriptive statistics including min, max, and mean height values. These values help us better understand vegetation at our field site. We often want to extract summary values from a raster. We can tell R the type of summary statistic we are interested in using the fun = argument. Let’s extract a mean height value for our AOI. Because we are extracting only a single number, we will not use the df = TRUE argument. It appears that the mean height value, extracted from our LiDAR data derived canopy height model is 22.43 meters. We can also extract pixel values from a raster by defining a buffer or area surrounding individual point locations using the extract() function. To do this we define the summary argument (fun = mean) and the buffer distance (buffer = 20) which represents the radius of a circular region around each point. By default, the units of the buffer are the same units as the data’s CRS. All pixels that are touched by the buffer region are included in the extract. Source: National Ecological Observatory Network (NEON). Let’s put this into practice by figuring out the mean tree height in the 20m around the tower location (point_HARV). Because we are extracting only a single number, we will not use the df = TRUE argument. 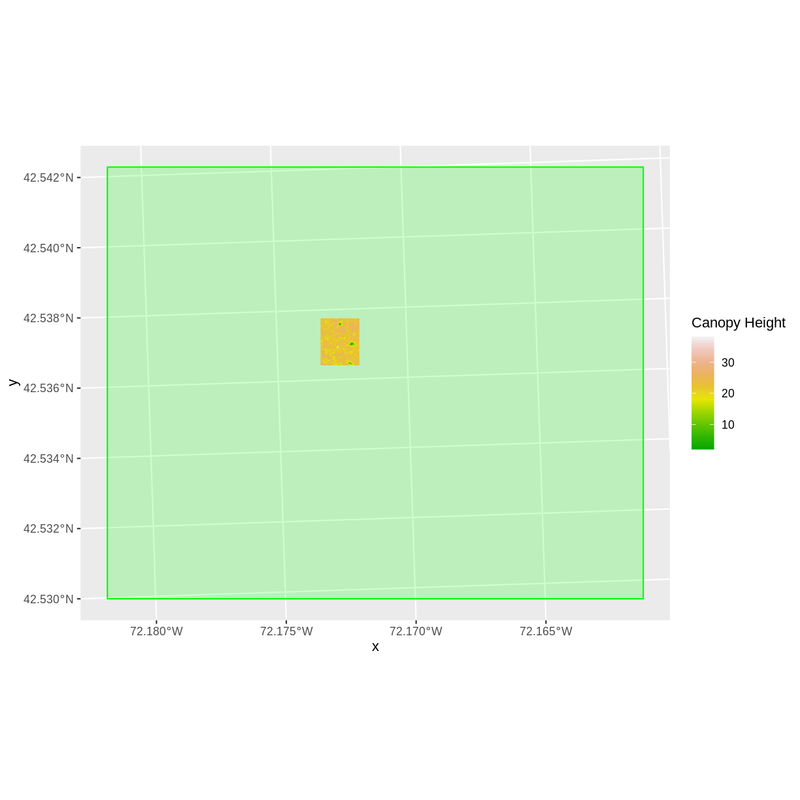 1) Use the plot locations object (plot_locations_sp_HARV) to extract an average tree height for the area within 20m of each vegetation plot location in the study area. Because there are multiple plot locations, there will be multiple averages returned, so the df = TRUE argument should be used. 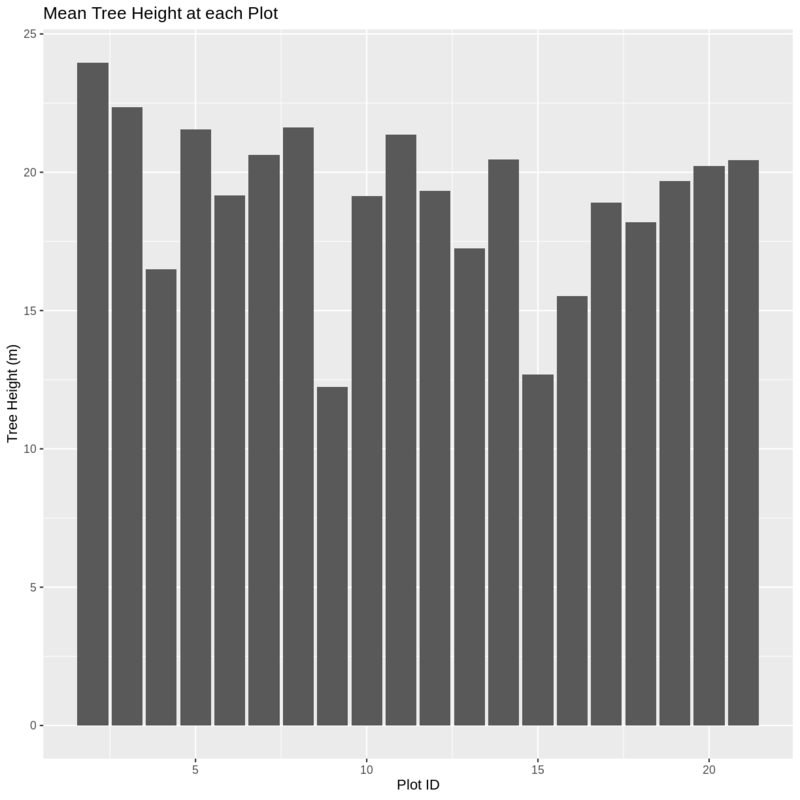 2) Create a plot showing the mean tree height of each area. Warning: Removed 1 rows containing missing values (position_stack).